Since returning from the Caribbean coast of Colombia, where 27 degrees with a breeze is considered arctic, I am quite enjoying winter in London. However, recovering from my third sniffle of the season already, it seems that the cold and drizzle might be getting to me somewhat. Given that climate control is not a power I possess, I decided that the best way to warm up during the winter chill is from within – queue a big batch-cook of some good old fashioned Jewish chicken soup. Having long been called Jewish Penicillin, this traditional dish is just the medicine to fight pesky winter colds. My mum, like any good Jewish mother, makes a mean chicken soup, and it’s her recipe I share with you today. My mum’s chicken soup contains no spices and relies on the chicken and it’s bones (with the help of added stock) for flavour. You can add in some chopped parsley or dill at the end, but I think the beauty of the dish lies in its unapologetic blandness. Many chicken soup recipes call for skimming off the fat which rises to the top as the chicken bubbles away. Us Bidmead’s leave it be, and I’m a firm believer that it’s this beautiful golden fat itself that adds to the soup’s medicinal properties. As for the use of instant matzah ball mix, it’s like my mother always used to say – there are some things you should cheat at. Maths tests, no, making matzah balls, yes. 5 tbsp chicken stock concentrate in 2 litres of boiling water (by all means use homemade if you have. This concentrate equates to the strength of about 2 litres of normal chicken stock). Heat 1 tbsp of rapeseed or sunflower oil in a large pot. Add celery, leeks, carrots and onions and cook on a medium heat for 5 minutes. Do not brown – you just want to sweat them, not cook them. Add in the chicken and stock, and make sure all the chicken and veg is covered in the liquid. Once this reaches a boil the heat turn right down to a gentle simmer and leave for about 45 minutes. After 45 minutes, remove the chicken pieces from the liquid and leave on a plate to cool down while the soup continues to bubble away. About 15 minutes later, the chicken should now be cool enough for you to shred it into very small pieces. (Here I like to nibble on the bones and giblets – personal choice). Add chicken back into pot. 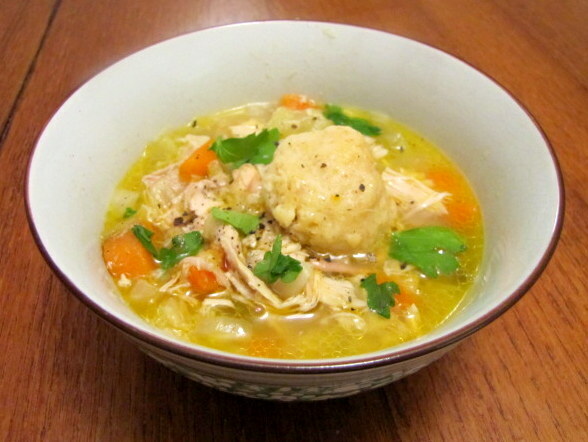 To make the matzah balls, you simply need to add one egg to a sachet mixture and leave for 3 minutes. Then wet your hands and roll into 12 mini balls. These double in size so don’t worry if they look small. Add the matzah balls into the soup and let it all simmer for just a little bit longer – 15 minutes is fine, although half an hour is better. This soup can be garnished with chopped up parsley or dill and goes brilliantly with some freshly ground pepper on top.